Cal Rei Vinyes is an 18th century house, with a traditional architectural style and materials, such as stone walls, wooden beams and fire places. The house is now both practical and comfortable, suitable for rural tourism purposes. Cal Rei Vinyes is located on the outskirts of Celrà, a cosy little village where you will find all kind of stores, and at the foot of Les Gavarres mountains. We rent the house, ideal for those families or groups of friends who would like to switch off from hectic urban life and live in complete harmony with nature. 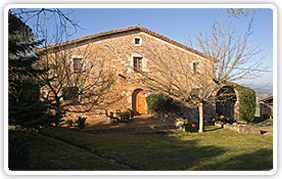 Isolated farmhouse with capacity for 18 people and exclusive rental for a single group, to enjoy relax of stay. Rooms and common areas spacious and comfortable. Equipped with everything needed for an excellent stay. It has Wifi / internet, gardens, swimming pool, barbecue and parking, among other services. 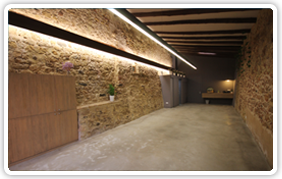 Located in the municipality of Celrà and very close to the village. At the foot of the natural space of the Gavarres massif, 10 minutes from Girona, 25 minutes from the Costa Brava and only one hour from Barcelona. 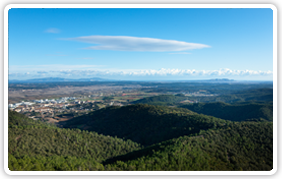 Located near to a large number of interesting towns, such as: Girona, Banyoles, Besalú, Pals, Peratallada as well as other natural and cultural places, such as: Theater Museum Dalí, Figueras, pottery La Bisbal Empordà, Natural park of the Montgrí Medes and Baix Ter, and the natural park of the Aiguamolls of l'Empordà. There are a large number of activities such as cycling, mountain biking, hiking, kayaking on the river ter and many water activities on the Costa Brava such as sailing, diving, snorkeling and windsurfing. You can organize courses and workshops of paintings and fabrics with local artists, for the entire family.